Just as many foreign universities have promoted their study abroad programs in China, Chinese campuses also began holding events overseas to attract students for an education here. Fifteen top Chinese universities took part in "Study in China," an event in London that included an exhibition showcasing the schools and a forum panel where university representatives answered students' questions. At the event were presidents and VPs of Peking University, Beijing Language and Culture University, Xi'an Jiaotong University and Harbin Institute of Technology, among others. The event was part of a weeklong education promotional campaign called the "China in UK Week." It was sponsored by the British Embassy's Culture and Education Section and held in London and Manchester on Oct. 22-29. Jazreel Goh, director of education marketing of the Culture and Education Section, said that in addition to Chinese language, many U.K. students have in recent years begun showing interests in studying economics and international trade in China due to the country's fast growing economy. Goh said the U.K. is encouraging more British students to experience university life in China. She said that the experience would give them an international vision, broaden their personal network, increase their confidence and skills in cross-cultural communication, and enhance their competitiveness in the global market. There are currently over 90,000 Chinese students studying in the U.K. Meanwhile, the number of British students in China stands at 3,300, 16th among all foreign students. The number has risen by 10 percent annually, demonstrating an expanding educational collaboration between the two countries. According to the Chinese Service Center for Scholarly Exchange under the Ministry of Education, the number of British students in China is expected to more than double by 2020. At the moment, university representatives at "Study in China" said the two biggest challenges international students face in China are language barriers and ways to adjust to Chinese culture and lifestyle. On the other hand, the number of Chinese students studying in Britain would not increase drastically, considering the current educational resources in Britain, Goh said. "We will work hard to keep a balance between the number of international students and what U.K. universities can provide them during the overseas experience." 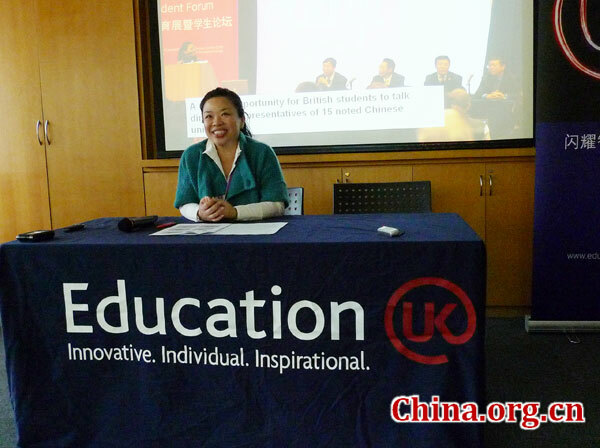 The "China in UK Week" also featured a series of career workshops for Chinese students in London and Manchester. Seven human resource executives from major employers in China, including Microsoft, Nokia Siemens Networks, Nestle and Deloitte, provided an overview of China's current job market, discussed their recruitment strategies and shared job and internship opportunities with Chinese graduates from universities in the U.K. The executives said Chinese graduates returning from the U.K. usually had an international vision and strong language skills, were open-minded, innovative and good at teamwork. According to British Embassy's Culture and Education Section in China, most of the over 20,000 Chinese returnees who have registered in the department can find a satisfying job within three to six months after returning from the U.K. They generally start with the same salaries as the local graduates but "show a brighter future in career within two years." During the same week, delegates from Chinese universities also met with their counterparts from about 30 British universities and signed agreements regarding student and faculty exchanges as well as joint research programs.